Want to get back to that joyful feeling of running and jumping freely around as you used to do as a kid? Parkour could be the answer for you. It will teach you to trust yourself and your physical abilities more, learn how to constantly improve yourself and challenge yourself continuously. You will also likely meet other people with similar mindsets while training and exercising your parkour skills, which is yet another advantage. Overall, you will find that your fitness level and physical health will improve immensely as you advance. You will learn how to properly control your body through power, agility and better balance skills. Your confidence will grow and so will your problem solving skills. Along with your training and gradual improvement, you will start respecting yourself more for your accomplishments. You must know the basics of parkour before you begin, and they are: progression plus repetition. You start with smaller jumps and movements and repeat them until you feel ready to do a bit more, jump a little higher and push yourself further. Then you repeat again, until you are ready for yet another small step ahead. This means that you need patience, discipline and consistent training. There are no shortcuts to learning how to jump from one rooftop to another from scratch. It is all hard work and persistence. Parkour means training with your environment and the circumstances surrounding you in mind. You will learn how to think quickly to be able to resolve obstacles you come upon while training. As much as it is an activity which requires a lot of hard work, parkour should be fun too. So, make sure you enjoy the creativity and free spirit of parkour when you start training. Parkour means overcoming any kind of obstacle in French. It is a way to naturally move through the natural and manmade environment, all barriers and life. Regardless of what you may be thinking after watching a parkour video, it is not tricks, acrobatics and flips only. These can be used to pass through certain obstacles more efficiently, but they are not an absolute must for this activity. It doesn’t have to be complicated, and you don’t have to be a fit youngster to start training parkour. It is actually for everyone. Anybody can use their minds to find the best way to get from one point to another and pass through an obstacle safely and efficiently. The methods can change over time, but the mindset is the same for young and old, for newbies and for experienced traceurs. Go out to train prepared. Make sure anything you can control is taken care of such as: being properly rested, fed, concentrated and in shape. Leave yourself free to worry about the obstacles you cannot control on your way. Trying to find the quickest and bets way to pass through them will change you entire view of the world surrounding you. By training more you will find that your fear of seemingly impossible to pass through obstacles will start to decrease and diminish. 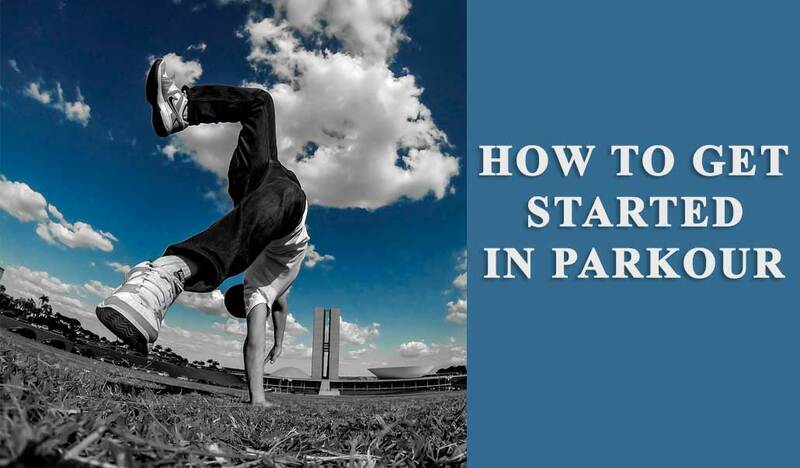 Quick guide – How to do parkour for beginners? Start with these exercises and do 2 sets every day. If it is too strenuous, start with one set and gradually increase them. The goal is to do 10% more exercises or sets next week. Every week add 1 or 2 reps to every set of exercises. Once you reach the point where you have doubled the reps for each of the exercises, it is time to add a whole other set to your daily workout. When you reach the moment when you are doing 4 x 20 reps per set, start doing each one faster and more explosively for a better workout. The goal is to reach 5 x 20 reps. Then you can go ahead and add a new and more difficult exercise to your workout regimen. You can start training jumps. Do this by practicing whole body jumps on stairs or steps. Do it with a balanced and relaxed body and make sure you land on your toes softly. Repeat this 10 times. Start with 1 or 2 steps, and keep adding a step to the jumps next week. Jumping 3 or 4 steps is a moderate challenge while 5-6 steps is difficult. Make sure you drink a lot of water during your workout. If you have the possibility, take the advice of an experienced traceur to help you learn to jump and do these exercises safely and properly. There are a vast number of online videos which can show you the proper techniques for the different types of jumping and landing styles which you can refer to as well. Be careful and not too overconfident as you are progressing in order to avoid injuries. After some time of this basic training, you should be able to perform sets of exercises with ease, such as jumping up and grabbing to a rail for a pull up, broad jumps, plyometric push-ups and jumping from a table with your knees tucked. When you can do this without too much effort, you are ready for the more advanced and fun stuff, so go outside and start training today!